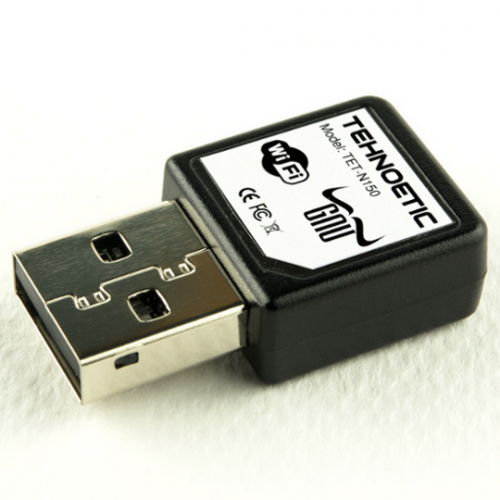 Tehnoetic TET-N150 is our own branding for the Unex DNUA-93F, with a guarantee that the TET-N150 version ships with the Atheros AR9271 chipset that uses free software drivers and firmware; we can make no guarantees that other versions of the DNUA-93F will ship with the same chipset. The Technoethical N150 Mini Wireless USB Adapter respects your freedom, which means you can connect to Wi-Fi networks using only free software. This is because the integrated circuit of this adapter is Atheros AR9271, one of the few circuits in the world able to connect to Wi-Fi networks by using exlusively free software. You might also be interested in the Technoethical N150 High Gain Antenna, and the Technoethical N300 Wireless USB adapters. The Technoethical N150 is based on the Atheros AR9271 integrated circuit. It works with the free driver ath9k_htc (GNU GPL v2) and the free firmware for ath9k_htc (Clear BSD). Thus you can use it with a completely free GNU/Linux distribution, which has the kernel Linux-libre, clean of the nonfree blobs from Linux. Using the latest versions of the kernel (3.0 or later), the adapter works out of the box when plugging it on USB, and you don't have to manually install the firmware anymore. Because the firmware is free, you can study it and check what exactly it's doing. Moreover, you can modify the way the adapter works, so it can be an important resource for educational experiments or for your business. With the Technoethical TET-N150 adapter, your are in control of your own computer for connecting to Wi-Fi networks too. Buy it for your laptop! You have a laptop with a wireless card which doesn't work with free software or it's broken. Plug the Technoethical TET-N150 in an USB port and connect to Internet. It's so small, you will forget that it's there! Buy it for your desktop! You have a dektop computer and want to get rid of the wires. 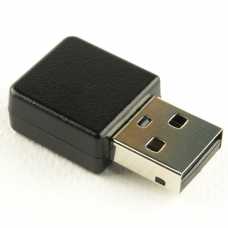 Plug the Technoethical TET-N150 in an USB port and connect to Internet. You get rid of the wire and you continue to use free software. Buy it for your development board! You have a development board or an embedded device without an integrated chip for connecting to Wi-Fi networks or with one which doesn't work with free software. Plug the Technoethical TET-N150 in an USB port and control your device remotely (also through Internet). This adapter is produced by Unex and it is sold by Technoethical under its own brand, as a warranty that the integrated circuit works with free software.